Have you heard that something really exciting is about to happen in Stokke circles?????? To celebrate our big launch on 01/04/10 we are giving away not one, not two, not three, not four...... but FIVE Stokke® Xplory® strollers in celebration of the wonderful Stokke® product reviews that are spreading the Stokke Love around the web! 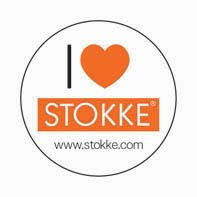 All you have to do to enter is post a review or write a blog post reviewing any Stokke® product. Come back to this post to leave your review url in a comment. The winning reviews will be announced here on 01/04/10. This promotion is open to UK residents only. We will not be able to ship product outside of the UK. The prizes are x 5 orange Stokke® Xplory® strollers. RRP £729. Product shipped to UK address only. No cash alternative is offered. I have reviewed the glorious Stokke Tripp Trapp and we're big fans. I've never posted a review of it until now. Great Idea for a competition. Thanks for the brilliant review... Tripp Trapp® does have a 7 year warranty though. Although like I said I've not needed it yet with my daughter and hopefully the new baby on the way will be able to use it for at least another 4 years. If you think that you can pass off a second hand Tripp Trapp to your new baby you are way, way, wrong! I have three small children. They are now 9, 8 and 6. They treasure and honor their Tripp Trapp's and would not part or share them for more than a single meal. The power of the Tripp Trapp® is strong and even at 9 my son has shown no interest in moving on to another chair. That is his chair and that is that! A Tripp Trapp® is a chair for life... their life.. to be treasured and passed on to their own children! Take it away at your peril... perhaps this is where we put in a company disclosure! I have reviewed the Sleepi cot on MadeFoMums. Really happy to recommend it, a great investment nursery piece. Winning an xplory would be amazing, I would no longer go green with envy every time I spot one out and about! Not sure if link was right so here it is again, Excellent competition!! Blondie Boy and I tested and reviewed the Table Top! Here's another link..I copied and pasted all my notes _ duh !! so the last one posted is the one. I have notified them, so hopefully they will delete the dud one. Thanks for running such a great competition too. Sorry if this is a duplicate but I am not sure if my previous comment saved/posted! Thanks for running this great competition.